When discussing family planning with your doctor, she will probably ask whether you are taking a prenatal vitamin or if you would like a prescription for one. Prenatal vitamins are specially formulated supplements designed to help a pregnant woman get the proper vitamins and minerals needed to support her and the growing baby. In particular, pregnant women need extra folic acid (400 mcg to 800 mcg) to prevent certain birth defects, iron (27 mg) to ward against anemia, and calcium (1,000 mg) to preserve maternal bone density. The American College of Obstetricians and Gynecologists (ACOG) also recommends pregnant women also take at least 200 mg of docosahexaenoic acid (DHA). There are a lot of misconceptions about prenatal vitamins. 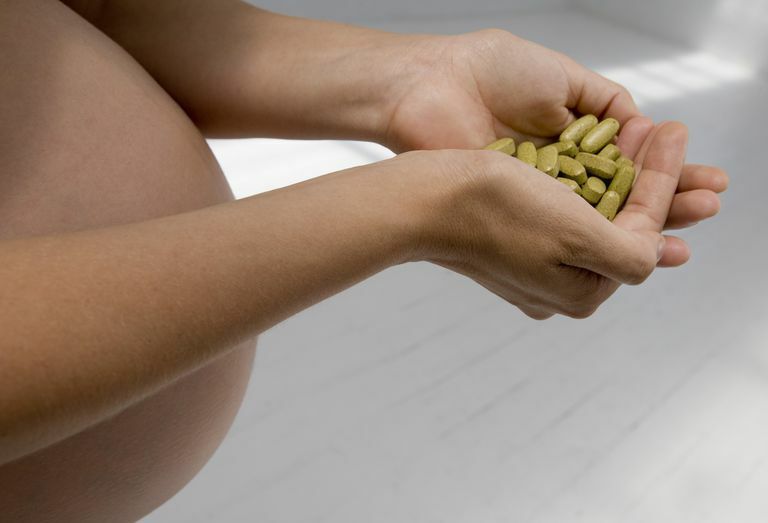 Here are some of the most common myths about prenatal vitamins and the facts. Some pregnant women believe they don't have to concern themselves with eating healthy as long as they take a prenatal vitamin. This is not true. The goal of prenatal vitamins is to supplement your diet not to replace it. In fact, prenatal vitamins work better when you are eating a healthy diet that includes a variety of foods. Prenatal vitamins do not cover all of a pregnant woman's nutritional needs. For example, a pregnant woman needs about 1,200 mg to 1,500 mg of calcium a day, however, most prenatal vitamins only contain 250 mg. The rest should come from your diet or an additional supplement. Not all vitamins are created equally and many vitamins that are available by prescription are also available over the counter, but that doesn't make them less effective. The main difference is the cost and who is paying for it. Prescription prenatal vitamins are typically covered by insurance companies. Over-the-counter vitamins are not covered by insurance and need to be paid out of pocket. Most doctors recommend their pregnant patients take vitamin supplements, but they do not need to be specifically formulated for pregnancy. There are also some good multivitamins available that are safe during pregnancy. In choosing a multivitamin, ensure that it has an adequate amount of folic acid (400 mcg) and the right amounts of other vitamins and minerals. Some vitamins, like Vitamin A, in high doses, can cause birth defects. The recommended dietary allowance for pregnant women is 770 mcg. This only partially a myth. If you are planning to become pregnant, you should begin taking a prenatal vitamin hopefully at least several months before you become pregnant. However, if you become pregnant prior to taking vitamins, it is still advised to begin taking prenatal vitamins immediately as they are still beneficial. Calcium: It is unlikely that your prenatal vitamin will contain all of the calcium you need. Pregnant women need 1,000 mg of calcium daily. If you are unsure or unlikely to get enough through diet, consider taking a separate calcium supplement. Vitamin A: Too much vitamin A can cause birth defects, be sure that you're using a prenatal vitamin or a multi-vitamin with under 10,000 IU. Iron: Some women do not absorb all of the iron in their prenatal vitamin and may need an additional supplement. If you are concerned about low iron levels or anemia, talk to your doctor or midwife. Folic Acid: Pregnant women need at least 400 mcg to 800 mcg of this nutrient daily to prevent birth defects known as neural tube defects, including spina bifida. Some pregnant women find vitamins bother their stomach. It can help to take your vitamin later in the day or with a meal, especially if you suffer from morning sickness. You may find another brand is more tolerable. If you have any questions or are in doubt about the supplements you are taking, bring your bottle of prenatal vitamins with you to your next doctor's visit to see if they are right for you. Your doctor or midwife can help to answer any questions you have about nutrition during pregnancy.